The straight stair lift is the perfect choice for anyone with a two-story home with a straight staircase or a single story home with a basement. 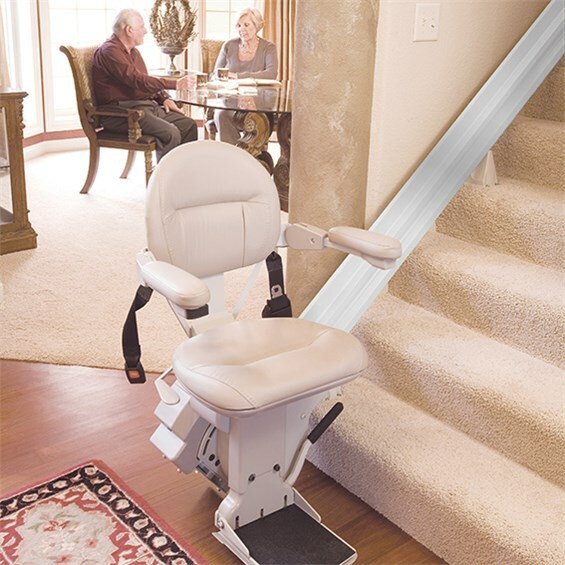 The smooth start and stop features of the straight stair lift ensure a safe and comfortable ride. The traditional straight stair lift is designed to move up and down one straight flight of steps. No unsightly structural work is needed for a stair lift; it fits directly to your stair treads rather than to the wall. 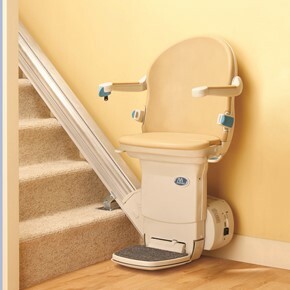 This is the simplest stair lift design and the least expensive model of stair lift available. 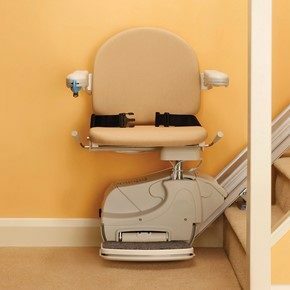 The arms, seat and footrest all neatly fold away on the stairlift, allowing for smooth stair passage for non-lift users. The lift can be ‘called’ or ‘sent’ up or down the stairs whenever it’s needed, making it easy for multiple users to control the stair lift. 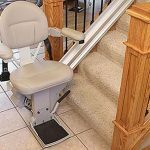 In situations where two flights of stairs meet at a landing, as a cost-saving measure it is sometimes recommended that there be one straight stair lift installed for each flight of stairs, with the user transferring from one lift to another at the landing. The decision to do so would be dependent upon the prognosis of the individual as it relates to any possible progression of their disability. 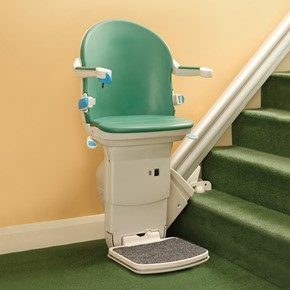 One exceptional product for your consideration is the Brooks Straight Stair Lift, which is handcrafted not only to provide an incredibly smooth, comfortable and quiet ride with every use, but is also tailored to be a beautiful addition to your unique home design. Safe and easy to use, the Brooks Straight Stair Lift comes standard with the joystick control and remote control system. Designed with an attractive slim line design, it runs on maintenance-free rechargeable batteries even during a power outage. It comes with a numerical fault code display, for easy diagnostic and repair guidance. The controls are easy to use, as easy as pushing the armrest paddle in the direction of travel. 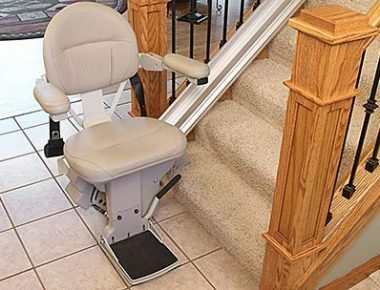 One option that is available is the hinged rail which is ideal when the standard stairlift rail presents an obstruction to a doorway at the foot of the stairs. Brooks Stair lifts are built to last, with low maintenance and high reliability. They run on maintenance free DC Power packs, which are automatically recharged at the end of every trip. 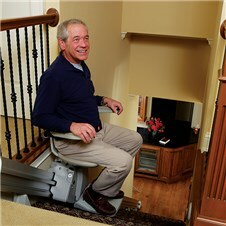 So even if there is a power outage the Brooks Stair lift glides smoothly to its destination. Let’s face it — when mobility issues become a matter of real concern in your life or that of a loved one, it can be difficult to absorb the implications of just how much of every day is affected by this new learning curve. But it doesn’t have to be a negative experience. Built for comfortable and safe movement from one floor to the next, a straight stair lift is ideal for those who aren’t able to tackle the stairs the old-fashioned way. To learn more about the the Brooks Straight Stair Lift, contact your certified aging in place specialist at Stair Lifts Atlanta for a complimentary in home consultation by calling (770) 880-3405 or sending us an email using our website contact form.